EQ4PM: Applied EQ #10: What am I feeling Now, Part 4? Applied EQ #10: What am I feeling Now, Part 4? The last few posts we have talked about techniques for increasing our self awareness. Without knowing what we are feeling, we cannot begin to manage ourselves or others. Using the Face in the Mirror Technique will help us to increase our awareness. This is closely related to technique #2 that we discussed last time, taking a physical inventory. The face is a reflection of what is going on in our bodies. In his book Blink, Malcolm Gladwell discusses the work of researchers Silvan Tomkins and Paul Ekman. Tomkins and Ekman conducted extensive experiments on human facial expressions. They found that across societies there were a common set of facial expressions caused by underlying emotions. Tomkins and Ekman decoded the facial expressions and catalogued three thousand unique human facial expressions having emotional meaning. The point is not to teach you three thousand facial expressions; rather, it is to demonstrate that your face represents the window to your emotional soul. By understanding what emotions look like, you can use your own face to better understand what you are feeling. Later, we will apply this same technique to decode the faces of others. Poker players are well aware of the face as a window to the soul. I was for a short time a junkie of the World Poker Tour; I could not stop watching it on TV. I was fascinated by the various ways in which the different players would hide or camouflage their faces so as not to give away their hands to their opponents. Most players use hats and sunglasses to hide much of their faces. One player named Phil Laak has been dubbed the “Unibomber” for his tendency to wear dark glasses and a hooded sweatshirt to cover much of his head. When he is under the gun, Phil will take in the drawstrings on his hood until none of his face is visible to the other players! What does all this have to do with applying emotional intelligence? 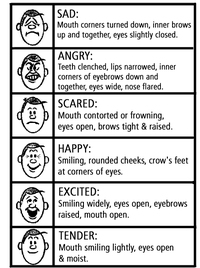 By studying our own faces, we can learn about the emotions we are feeling. We can use our own faces as a guide. We don’t have to know 3,000 expressions. We only have to learn the various ways in which the 6 families of feelings will show on our faces. The chart below contains a quick taxonomy of faces representing the 6 families of feelings, with a picture and a brief description of each. Like the physical inventory we talked about last time, you can use the face in the mirror technique to help you understand your emotions better. As you have a feeling, check out how you look in the mirror. With practice, you will be able to recognize what you are feeling based on your face. This practice will also be very helpful for you when you are determining what others are feeling. In the next post, we will talk about the fourth self-awareness technique: Paired Sharing. The analogy to playing poker is great. First step, know your own hand. Second step, try to read the hand of others. Finally, if you're really good, deduce what they believe you're holding. In relationships, know thyself first, then get to know others. Shouldn't we also "feel" how they "feel" about us? Just a thought. Steve, I agree 100% with your assessment. I believe there is another step in poker in addition to the one you mention (i.e. deduce what they believe you're holding), that is, poker players try to convince the other player that they have a certain type of hand. In some cases this could mean making the opponent believe they don't have a strong hand (thereby increasing the pot) or that they actually have a strong hand (when bluffing for example). So it is not just about understanding the state of the other but changing or managing that state. This is about influencing the emotions of the other and that is important whether we are talking about poker or project management.